A scandal-prone, dark-horse presidential candidate turned front-runner stars in Citizen Jack. Sound familiar? Imagine a universe in which a presidential candidate with a checkered past can go from being labeled “Jackass of the Week” to a serious contender after a tragedy turns into a stroke of PR luck. Well, maybe that’s not so hard to imagine. But imagine the meteoric rise was concerted by a demon named Marlinspike. This is the universe of Image Comics’s Citizen Jack. 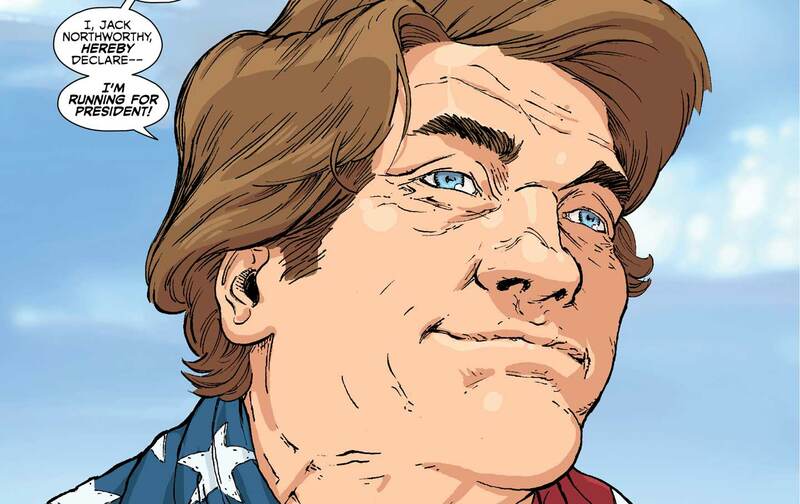 Created by Sam Humphries (Star-Lord, Weird World) and Tommy Patterson (A Game of Thrones), Citizen Jack follows the exploits of presidential candidate Jack Noteworthy, a Donald Trump meets Rob Ford–type figure, as he navigates his way up the polls. An unlikely pick for a nomination, he was the mayor of a town in Minnesota until he was impeached after being arrested for cocaine possession and charged with bribing the prosecutor (though all charges were eventually dropped). When we meet the washed-up former mayor, he’s wearing a pink bathrobe and cowboy boots as he rides around town hawking snow blowers and threatening government employees, including the current mayor (who also happens to be his ex-wife). Jack’s desire’s to overcome his scandalous past leads him to seek Internet fame by announcing his run for president while wrapped in a flag, just before jumping into a frozen lake. While the media finds his declaration ludicrous, Jack’s proclamation that “political elites are killing” America and that what the country needs is a “man of action” strikes a chord with voters. Jack’s “man of action” persona further solidifies his electability when, during a press event, the governor of Ohio (a friend of Jack’s) is assassinated and Jack heroically punches the shooter. All of this, of course, is coordinated by Marlinspike, the demon who always seems to be rattling around in the background, whispering (sometimes yelling) in Jack’s ear, making demands, suggestions, jokes, and snide comments. 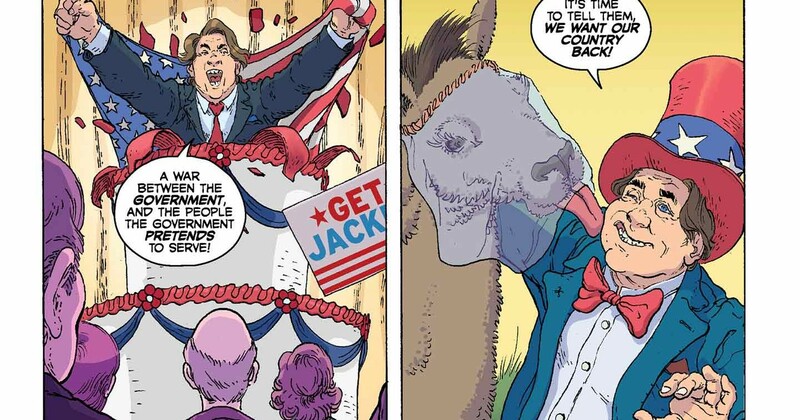 The first two issues of Citizen Jack (the second issue went on stands this week) set the stage for Jack’s political ascent. While there are no direct references to specific issues plaguing society, and no Democrats or Republicans (instead it’s the Freedom Party and the Patriot Party), the media landscape in this universe, complete with infotainment and loud-mouthed pundits, feels familiar. Humphries focuses on one show in particular: Fire Fight, a Crossfire-type program that features one rational anchor—a talking dolphin named Cricket. Humphries never gives an explanation for the existence of Cricket, nor does he show that there are other anthropomorphized animals in this world. The other Fire Fight anchors dismiss Cricket, not because he’s a talking dolphin wearing a suit, but because they find his comments to be tedious and boring, despite their accuracy. Regardless, Citizen Jack is a biting critique of the American political system, from its portrayal of the media to the behind-the-scenes wealthy donor backing Jack for an unknown reason (if not just for his own amusement), to Jack’s everyday American supporters, who are depicted not as well-informed voters but as fans, copying Jack’s signature pink bathrobe and cowboy boots. But comics have always served as both a mode of escaping reality and a mode of reflecting of it. The earliest comics, the Sunday funnies, were a shock of color in the otherwise dreary and dark days of the Depression. With the arrival of Superman in 1939, comics were not just a dodge from reality for kids but a comment on the politics of the day for adults, dealing with issues like American isolationism, the criminal-justice system, and xenophobia. The first issue of Superman featured the hero saving an innocent woman from the death penalty by proving she was falsely convicted, giving a spousal abuser his “just desserts,” and compelling a confession from a corrupt lobbyist. Many of the most successful comics—and the most popular characters—came out of politically charged times. The early 1940s brought us moral, patriotic heroes like Superman, Captain America, and Wonder Woman, while the 1960s introduced equality of opportunity–driven characters like Spider-Man and the X-Men, as well as the first African-American characters and heroes. In the 1980s and ’90s, apathetic anti-heroes like the Watchmen and Deadpool become popular. Some of the biggest comic-book movies of the 2000s, including Iron Man and The Dark Knight, had considerable political underpinnings, addressing issues such as class warfare and the privatization of the military. This forces the question: Are political comics more successful? As politics becomes just another form of entertainment, are publishers trying to create story lines that are more politically charged, or hire writers with more political backgrounds—as might be indicated by Marvel’s recent decision to sign Ta-Nehisi Coates to write a Black Panther comic in 2016? Humphries says no. And so Humphries created Jack Noteworthy, a buffoon who makes a deal with a demon to become president. 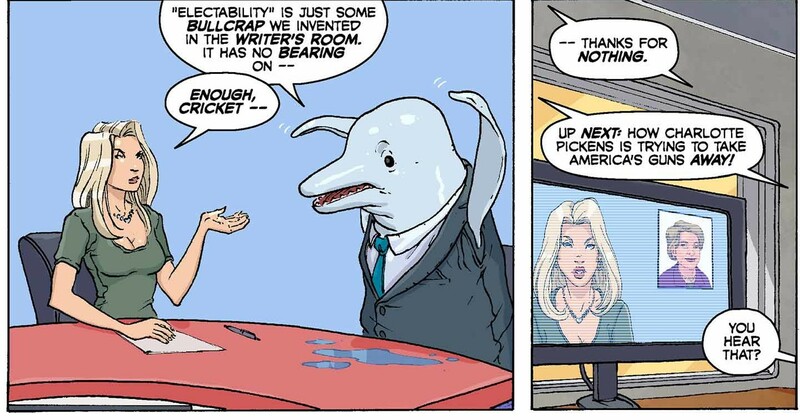 Sadly, our 24-hour news networks lack an enlightened talking dolphin.